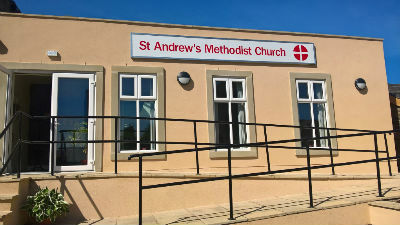 St Andrew’s Methodist Church works closely with the other churches in Barnoldswick as part of the “Hope Barlick” movement. The congregation have moved back to their site, just off the main road through the town, following completion of the replacement church centre. The congregation have a tradition of hospitality and look forward to the new opportunities that the more compact, café style premises will offer. Our Family Worker (Ruth) regularly goes into the local primary schools to take assemblies and has also taken lessons with Year 6 to help them think about their move to high school using 'It's Your move' by Scripture Union. We are involved with Hope Barlick (the churches working together in Barnoldswick) which includes providing Bible based craft activities at 'Barlick Beach' each Monday in August and also running a Messy Church and Praise on the Beach one sunday. We have also collectively organised a Light Party in October and the Christmas lights switch on.